← What do you do when the rug is pulled from under you? 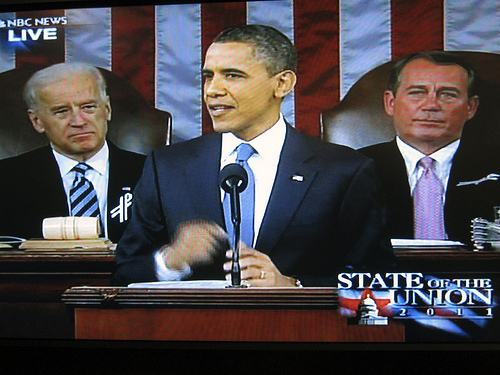 Everyone seems to offer a response to the State of the Union address these days. We even got two televised responses last night. So I thought I would as well. Unfortunately, there’s not a whole lot to say. The President spoke mainly about the future. Presumably, he and his advisors felt this would be the best political strategy. Was it? Who knows? I’ll leave that to the partisan political commentators on television or in the newspaper. But from my perspective, the speech was a missed opportunity to talk about how a lot of Americans are still hurting today, and what this President is going to do about it – for make no mistake about it, there are many things he can do. Let’s break it down. The President told us that education was critical to the country’s future, but didn’t say anything about helping the one million homeless children and youth living in unsafe conditions attend school while their families obtain housing. President Obama also talked about veterans, but he failed to reiterate his recent statement that the US should have “zero tolerance for veterans homelessness” (he did mention it at a White House event earlier this week). I also heard a brief mention of housing, but only as part of an argument for government consolidation, premised on a belief that too many federal agencies focus on housing. Would that this were true. Where was any mention of the foreclosures that continue to plague American communities, with the related simple pledge to release $1 billion in federal funds to help temporarily unemployed or sick homeowners pay their mortgages and avoid losing their homes? This is money that Congress already gave to the Administration, that will expire at the end of September with the federal fiscal year. Not to mention, there wasn’t any promise of finding additional funds. And finally the President talked about tax reform. How does that impact homelessness? Well, the home mortgage interest deduction costs the government 3-4 HUD budgets each year. That’s real money. And consequently, many of the serious tax reform proposals out there recommend capping it. If we do that, the question is what to do with new revenues – support our fellow Americans when times are tough or simply reduce the deficit. A creative hard-charging Administration could work with Congress to get tax reform complete before the 2012 elections, ensuring that a percentage of new revenue helps support our social safety net. Will the Obama Administration be willing to fight for average people like this? It’s hard to say. They’ve got 2012 on the brain. But for people who are homeless today, that’s a very long time to ask them to wait. This entry was posted in Housing, Veterans and tagged domestic policy, homelessness, Housing, Obama, SOTU. Bookmark the permalink. As I have been homeless for 20+ yrs I am only interested in the now someone who has been on the streets in america as long as I is statistically on borrowed time and doesn’t have much future to look forward too so I agree that asking me too wait, am I afforded that opportunity?